An experiment in feeding farmed salmon GM feed is underway in the highlands of Scotland – and you should be worried. The BBC news, naturally, was the first to trumpet the benefits of the GMO experiment, claiming that the aim of the trial was to increase the nutritional value of the fish and that a positive outcome would help us feed a starving world. The BBC’s extreme bias in favour of GMOs is a national disgrace and is something we have exposed previously. The fish are being fed genetically modified camelina, or false flax – an open air trial for which Beyond GM and other UK groups have been very vocal about opposing. The camelina has been engineered to produce the type of omega-3 found in marine fish, and is underway at Rothamsted Research’s farms in Hertfordshire and Suffolk. Researchers have always said that the plant was intended as food for farmed salmon, so we cannot pretend that news of this experiment has come completely out of the blue. At the same time, important questions about its safety and necessity remain. While details are scant it’s worth asking whether this an open water trial and what failsafes have been put in place to ensure that none of the GM feed escapes to be eaten by wild animals. In addition, while industry can be less than transparent about what it actually already feeds salmon, it is likely that some farmed salmon are already receiving GM feed. Given that farmers of land animals are already observing health deficits in animals fed GMOs, what effect if any would a near wholly GMO diet have on the health of the fish – and are the researchers even looking at that? It is correct that levels of omega-3 oils in farmed salmon have been dropping. But the broader context is that farmed salmon have a completely different nutritional profile than wild fish anyway because they are farmed. As we written recently farmed salmon are some of the most abused livestock in the world, second only perhaps to chickens. Keeping these large fish, that are used to swimming vast distances in open water, in small cages, and feeding them manufactured pellets is a cause of extreme stress, and makes them vulnerable to multiple diseases including infestation with sea lice. To fight these diseases the fish are treated with antibiotics and pesticides. Salmon farmed in open waters can pass infestation on to other fish and the high concentration of fish on one area leads to pollution from their faeces and other waste products as well as from toxic chemicals. All of this creates an abused fish that is inferior to its wild relatives. For those who are sceptical about the harm inflicted on Scottish farmed salmon we suggest you take a look at the selection of photographs, released by the Scottish Government in response to a Freedom of Information request, which document examples of disease and injury in farmed salmon over the last two years. You will need a strong stomach. Even if the trial is a ‘success’ and raises the level of omega-3 in the salmon a bit, it will fail to address the real issues around farmed salmon – namely that, like all intensive livestock operations, it is a vile and unsustainable industry and we should not be seeking to expand it. It is correct to say that anchovy numbers are now very low. This is because we have nearly driven the anchovies to extinction by ‘harvesting’ them in incalculable numbers in order to feed the salmon farming industry! Indeed it isn’t much of a stretch to say that this industry is the epitome of the kind of dumb, unsustainable thinking that has led our food system into the chaos it is in now; a ceaseless pattern of exploiting a natural resource as widely as we can and then, when it is exhausted, moving on to some low hanging technofix to keep our businesses afloat a bit longer. While this is a common argument, no GM food has ever filled a gap between supply and demand. Demand, in any case, is a wobbly concept largely created by a marketplace looking to hawk low quality goods for high profits. There is no demonstrable demand for GM-fed fish and above and beyond that fact, companies, supermarkets and restaurants that are truly concerned with feeding the world ‘sustainably’ should be demonstrating leadership by a) taking farmed salmon off the menu and b) respecting the limited availability and seasonality of fish and other marine foods. Feeding the world is such a patently false construct it amazes us that biotech companies continue to use it in their rhetoric. A 2016 report, Feeding the World, produced by the US Environmental Working Group, is very clear, for example, that the agricultural industry promotes the false notion of ‘feeding the world’ in order to deflect attention from its environmentally destructive practices. In any case, it is absolutely false to suggest the Scottish salmon industry, in partnership with the biotech industry, will be feeding a starving world. Farmed salmon is sold to the highest paying market and that is not the starving children of the developing world. Farmed salmon, like so many products of industrial farming, is feeding a marketplace made up of retailers and consumers that don’t know – or worse refuse to recognise – the meaning of words like ‘limits’, ‘sustainability”, ‘nutrition’ and just plain ‘no’. There is no justification at all for eating the amount of salmon we do right now. While some may view farmed salmon as a triumph of food democracy, bringing what was an expensive occasional treat to the level of an everyday food has caused untold harm to the environment and the fish. Equally importantly, it does literally nothing to address global hunger or malnutrition. Omega-3 is available to everyone – salmon is not. Yes, the population is growing and so-called healthy oils are part of the spectrum of nutrients we need to maintain health. But we already produce enough food to feed twice the global population (and then criminally waste half of it). What is more, omega-3 can be obtained in a variety of forms in a variety of naturally occurring foods – we do not need GM-fed salmon to add it to our diets. Omega-3 fatty acids are considered essential for human health, but the body does not produce them, therefore they must come from our diets. Depending on the source, humans can get dietary omega-3s from several different types of foods such as flaxseed, hempseed, canola, soyabean and walnut oils, as well as from dark-green leaves, wild caught coldwater fish such as salmon, mackerel and sardines but also algae and/or seaweed. It’s our diets that need adjusting – not the fish. 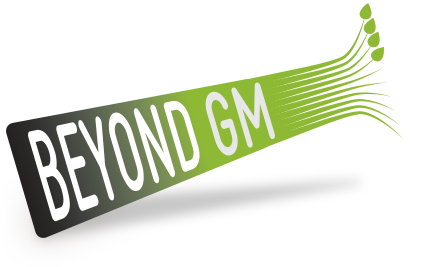 We’d love to see the labelling proposals for “GM Healthy Salmon”. While we wait for that bit of light entertainment, we’d like to ask the Scottish Government whatever happened to its much vaunted GM-free Scotland ‘policy’? As campaigners, of course, we were glad to see such apparent commitment by a devolved government getting column inches in the newspapers a couple of years ago. But the fact is it was always easy for Scotland to say it wouldn’t grow any GM crops because in the main the GM crops that exist are not suited to Scotland’s agricultural economy. As we have said endlessly, and not always to everyone’s appreciation, find a crop that is suitable for Scottish agriculture – a potato, for instance – and the honeyed words about a GM-free Scotland are likely to evaporate. And so it seems with the GM-fed salmon. 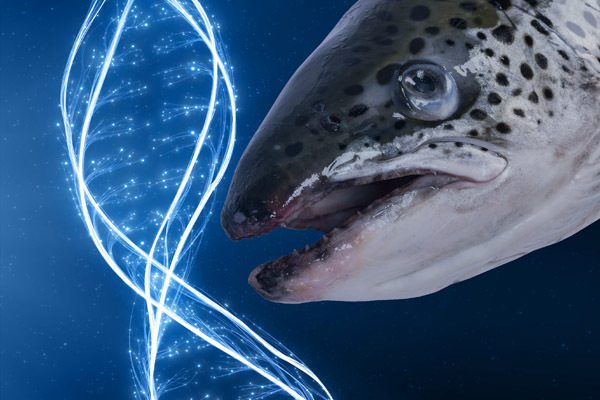 Scotland has allowed the farmed salmon industry to become so large and so important in monetary terms that it is prepared to look the other way when biotech companies offer a GMO ‘solution’ to the mess it’s made. In reality, unless we are vigilant and vocal, what a GM-free Scotland – and indeed a GM-free Europe – is likely to come to mean is that while consumers in the EU and UK may continue to refuse to eat it – at least as long as it is honestly labelled – no country seems terribly opposed to becoming a producer and exporter of GM foods into markets that are more than willing to feed GMOs to their citizens. The stench of this hypocrisy is almost unbearable. The GMO industry is changing and so are its tactics. Blocked for so long in Europe by strong regulation and the Precautionary Principle, biotech companies are seeking ways to use loopholes |(real and perceived) in that regulation – whether it be the allowed use of GMO animal feed and ‘processing aids’ or exploiting as-yet-unregulated genetic engineering processes – for short-term gain and the enhancement of international markets. In the UK the chaos of Brexit also provides fertile ground and a safe haven for advancement of these aims. In the future GMO foods may not just be grown on the land or in the water. They will also be produced in less transparent ways in factories and warehouses using GMO enzymes and bacteria to produce things like ‘healthy’ probiotics and oils for food supplements – including those that are fed to infants as formula. They are likely to include GMO meat, milk and dairy substitutes – all in the name of ‘healthy’ and ‘sustainable’ eating – and synbio versions of foods like cacao, saffron and vanilla and hops – many of which currently provide livelihoods for small farmers around the world. Producing these in the lab cuts out the middle men and all the expensive ‘complications’, like certification for fairly traded goods, which have been a thorn in food companies’ sides for some time. Sometimes here in the UK we shake our heads in disbelief at the way the biotech industry has overrun the food industry in North America and ask ourselves how it could happen. Open your eyes and take a look at what is happening in the UK and across Europe right now and you will see a real time example how it could, and indeed will happen, if we don’t challenge it now. Post your picture and comment to the wall in our GM Free Me campaign. It is vitally important that the people in this country who oppose GMOs show their faces. Make our politicians and policymakers look you in the eye by joining our visual petition. Sign our Mums Say No To GMOs petition to have all GMO-fed animal foods in the UK labelled to protect consumer choice.